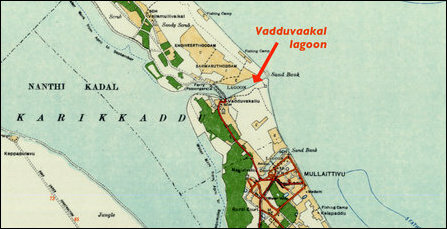 The sailors of the occupying navy of genocidal Sri Lanka's largest naval base in Mullaiththeev, SLNS Gotabhaya, which is located to the north of the narrow Vaddvaakal lagoon which links the largest Nanthik-kadal lagoon with the sea, have imposed an unofficial ban on fishing activities in the Vadduvaakal lagoon, complain the representatives of Mullaiththeevu Fishers Association. The SLN personnel started to warn the Tamil fishers to stay away from the lagoon which engulfs the SLNS garrison. When the fishers continued to engage in fishing and pleaded with the SLN that their families were dependent on the income from prawn fishing, the SLN sailors started to threaten the fishers away by pelting stones at them. This has now become a hobby game for the Sinhala navy personnel, the fishermen complain. The SLN sailors are shooting stones from top-most sentry posts targeting the small traditional wooden boats (kaddu-maram) of Tamil fishers. The kaddu-marams have no protective structure around and the fishers are exposed to stone attacks from above the sea level. There are also reports of similar assault on the sea side, the fishermen representatives complain. The area was part of the last stretch of lands where Eezham Tamils were subjected to genocidal war and final onslaught in 2009. 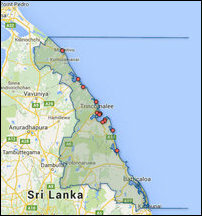 The SL Navy is refusing to hand over the lands it had illegally seized for the SLNS Gotabhaya. The fate of many of the unarmed people detained or filtered away by the SL military at Vadduvaakal in the final hours of the onslaught has not been established. It was initially launched as a Naval Deployment (ND) in January 2011 and later upgraded as a Commissioned Naval Base (CNB) with the title ‘Sri Lanka Naval Ship Gotabhaya’ in 2012. The naval base has transformed into a ‘Regional Security Center’ of the SL Navy, monitoring the coastal belt of Mullaiththeevu. 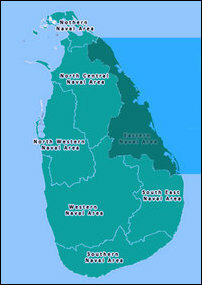 The ENA covers the most extended eastern belt of the occupied country of Eezham Tamils and consists of 13 Commissioned Naval Bases (CNBs). The ENA is the largest establishment within the SL Navy in the entire island. 22.02.18 Intense protest in Mullaiththeevu against SL Navy base block..
27.10.17 Occupying SL Navy wants surveying of Mu’l’livaaykkaal lands ..